Created in Belgium in the 1970's, Zinga provides both active and passive protection to metal surfaces such as galvanising, without the need for topcoats. Applied like a paint with brush, roller or spray, the film galvanising system can be overcoated with a minimum of preparation, working with the metal beneath to protect against corrosion. Zinga is designed to be a stand-alone system but can be used as a shop primer or in a duplex system, and for touching up and repairing worn and damaged hot-dip galvanized or metal-sprayed structures. Zinga has been used across the world on structures such as cement plants, dams, water turbines, power plants, bridges and airports. At Rawlins Paints we stock the full range of Zinga products, including spray aerosols, and Zinga coatings developed for marine use, such as ship hulls and immersed surfaces. Use Zinga EP Thinner HS to dilute Zingaceram EP MIO HS for use with sprayers during application and touching up with brushes. Use Zinga Thinner 41 to dilute Alufer N and Zingatarfree (Formally PU Tar Free MIO) for use with sprayers during application. 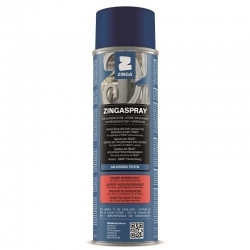 Zingasolv is the recommended thinner to be used with Zinga, Zingalu and Alu ZM when spraying. It can also be used for cleaning equipment. 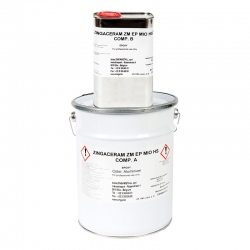 Zinga's comprehensive range of metal protection coatings includes primers, sealers, sprays, topcoats and solvents that can be applied on site. The one component zinc rich coating or Film Galvanising System contains 96% zinc (dust) in its dry film, with the purity of the zinc used so high that dry ZINGA does not contain any toxic elements. Simple to apply and re-coat with minimal preparation, Zinga delivers a higher standard of surface finish.